Thailand is one of the most popular tourist destinations in Asia Pacific. There are many beautiful places in Thailand, various menus of exotic Thai food, and local Thai products, all of these amazing things make Thailand become well known among tourists worldwide. International tourism largely contributes to Thailand’s economic growth. Tourism in Thailand fuel businesses, and dental clinics are no exception. 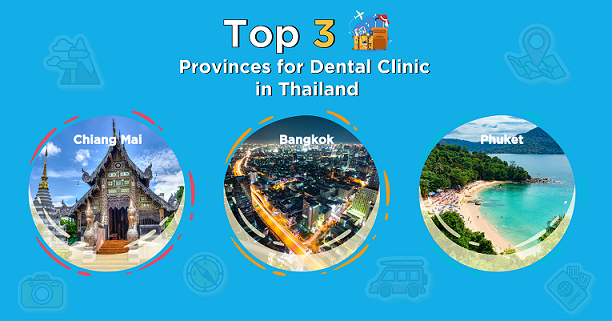 That’s why Thailand’s most popular tourism destinations like Bangkok, Phuket, and Chiang Mai become top three provinces for dental clinic in Thailand. Bangkok is one of the most visited cities in the world. While able to maintain its unique architecture and traditions, Bangkok really is a cosmopolitan masterpiece. There are famous department stores in Thailand such as Siam Paragon, Central World, and Emquartier. There is no reason to skip Bangkok whenever you come to Thailand. You have everything from top places for shopping to top quality dental care. While you enjoy shopping and eating in Bangkok, why not consider some dental care to make you ready to smile in every selfies. If you still look for the best clinic to take care of your dental health, look nowhere else. BFC Dental Center is your first-class dental clinic, with all 3 branches situated nearby famous department stores. Our Srinakarin branch is just opposite to Seacon Square Srinakarin. The Bangna branch is only a 2-minute drive to Central Bangna. Our newly open Sukhumvit branch is 8-minute from Terminal 21, Asoke. How convenient to shop and eat after you visit us? BFC Dental Center is definitely your answer for dental care in Bangkok. Phuket: Nightlife on the Beach and Smile to the Clear Sky. Phuket is renowned for beaches, famous islands, stunning beaches, nightlife etc. It is a true paradise and for those who love nightlife or just chilling on the beach. Diving in the middle of the sea in morning to see crystal clear water. Enjoying seafood at lunch. Visiting famous islands and temple in afternoon. Having some dental check up at the clinic in the evening to get ready for dinner. Partying at nightlife street next to the beach. All of these amazing lifestyles you can’t find anywhere else, only in Phuket. Chiang Mai: Land of the Local Culture and People with White Smiles. Chiang Mai is one the “high” places of Thailand. The reason is because most of Chiang Mai lands are hills. Tourists can visit the local ethnic hill-tribe called “Long-Neck Karen”. They have got their own style of life and unique design of goods. Travelers are always impressed and bought as a gift for their loved ones. Most of the time, the weather is cold in Chiang Mai. It is cold and could make you gnash all the time. So you should protect your teeth and gum by checking up at dental clinic in Chiang Mai for your own good teeth.